Ash Hemmings is determined to keep his AFC Fylde place tonight against the club he expected to be playing for this season. The forward made his full debut in Saturday’s win at Ebbsfleet United and hopes to help the Coasters extend their unbeaten start to the Natonal League campaign at home to Salford City this evening (7.45pm). Having spent last season at Boston, the 27-year-old signed for Salford but never played a competitive game for the promoted club, moving on to Fylde inside two months. Hemmings explained: “I was on the way down to play (for Salford against) Woking in a friendly. Graham Alexander (manager) named the squad and I wasn’t involved. 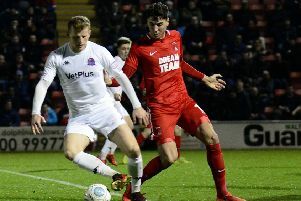 “I went into the stands and Alexander explained that Gary Neville (part of the club’s ownership team) had been on the phone to tell him AFC Fylde were interested in me. “Alexander was honest and left the decision up to me. Salford couldn’t guarantee me playing time. “I came up to Fylde with my agent and the place took me aback. I wasn’t expecting the brilliant facilities. After three substitute appearances, the Londoner was delighted to make the starting 11 last weekend. Now his target is to stay there and play a part in a promotion-winning season. Hemmings added: “I want to play as many games as possible. It’s been a tough start for me but following my start on Saturday I can hopefully push on. A second cousin of Watford striker Andre Gray, the widely-travelled Hemmings has played for half-a-dozen clubs in the Football League, including stints at Walsall and Dagenham and Redbridge. He has played for nine clubs in as many years but has soon settled into his new surroundings. Hemmings added: “I’ve settled in great from the first day. I only joined a week before the season started, so I missed the training camp in Scotland but it hasn’t affected me. “A lot of other lads have joined since, so I’m not the newest, which always helps.